(AP) NEW YORK - Prosecutors now say Wall Street swindler Bernard Madoff had plenty of people working with him when he began his conspiracy to rip off investors as far back as the early 1970s. The revelation came in a rewritten indictment that boosted charges against five long-time employees of the investment firm Madoff ran from his Manhattan offices. A November 2010 indictment had alleged that a conspiracy to defraud Madoff's clients began in 1992, and Madoff insisted at his sentencing that he carried out his scheme alone. But the newly written indictment, revealed Monday, says it began decades earlier with numerous other people in his office involved. The indictment also adds new charges of bank fraud and new tax offenses to the cases against five people who worked with Madoff. 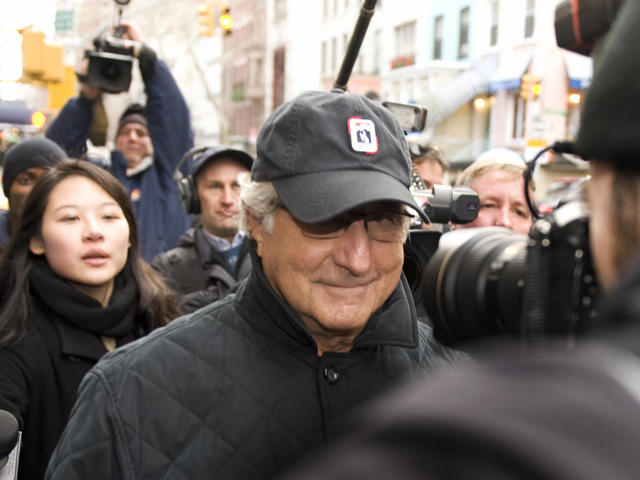 Madoff revealed the fraud in December 2008, admitting that the more than $65 billion he had reported holding for thousands of investors had dwindled to only a few hundred million dollars. An investigation found Madoff never made any investments, instead using the money from new investors to pay returns to existing clients and finance a lavish lifestyle for his family. Losses in Madoff's Ponzi scheme have been estimated at around $20 billion, making it the biggest investment fraud in U.S. history. Madoff, who's in his 70s, pleaded guilty to fraud charges and is serving a 150-year prison sentence in Butner, N.C. The charges in the indictment reinforce what the government has known about the massive Madoff investment fraud for years, FBI acting assistant director-in-charge Mary Galligan said. "This largest-ever Ponzi scheme was not the work of one person," she said in a statement. "Each of the defendants in his or her way allegedly played a key role in designing, building or maintaining the house of cards. The habitual doctoring of books and records, the fictitious trades, the phantom accounts, were the core of the charade. As alleged, they were the work of these defendants."